Sara Maitland's first novel, Daughter of Jerusalem, won the Somerset Maugham Award in 1979. Since then she has written five novels and six collections of short stories, the latest being Far North and Other Dark Tales (2007). 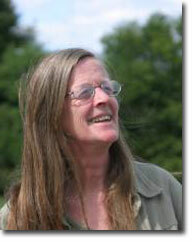 Sara Maitland also writes assorted non-fiction, including theology (A Big Enough God, Cassells 1995) and radio drama. She is presently working on a book about Silence (to be published by Granta in 2008) and, in search of that elusive lifestyle, has just built herself a “hermitage” on the Galloway moors in South-West Scotland.